The Research Triangle Park (RTP) is the largest research park in the United States. It is named for the three hub cities of Raleigh, Durham, and Chapel Hill, or more properly for the three major research universities in those three cities (NC State University, Duke University, and the University of North Carolina at Chapel Hill respectively). The Research Triangle region of North Carolina received its name as an extension of the name of the park. Besides the three anchor cities, the park is also bounded by the communities of Morrisville and Cary. Approximately one fourth of the park's territory lies in Wake County, but the majority of its land is in Durham County. RTP is one of the most prominent high-tech research and development parks in the United States. It was created in 1959 by state and local governments, nearby universities, and local business interests. Karl Robbins bought the land where the park is now built. The park covers 7,000 acres (2,833 ha) situated in a pine forest with 22,500,000 square feet (2,090,318 m2) of built space. The park is traversed by Interstate 40; the Durham Freeway; and NC 540. The park hosts one of GlaxoSmithKline's largest R&D centers with approximately 5,000 employees. Cisco Systems' campus in RTP, with approximately 5,000 employees, is the second highest concentration of its employees outside of its Silicon Valley corporate headquarters. The National Institute of Health has its National Institute of Environmental Health Sciences located in RTP and Durham. Research Triangle Park is owned and managed by the Research Triangle Foundation, a private non-profit organization. In August 2017, Scott Levitan was named the organization's new President and CEO, making him the 9th leader since the foundation was established. Following World War II, North Carolina's economy could no longer depend upon their traditional industries of agriculture, textiles, and furniture; their market share was in decline and jobs were leaving. Academics at N.C. State and Duke came up with the idea of creating the park so that the universities could do research together, leverage the area's strengths, and keep graduates in state. Established in 1951 and located in North Carolina, Research Triangle Park was created to increase innovation in the area. It is near Duke University, North Carolina State University, and the University of North Carolina at Chapel Hill. At first, the park struggled to recruit innovators, but in 1965, Research Triangle Park had its largest surge of growth, thanks to heavy recruiting by the state's government and Archibald (Archie) Davis. In their article "The Growth of Research Triangle Park," Link and Scott posit that entrepreneurial culture and, especially, leadership contributed the most to its success as a cluster. Archie Davis promoted a culture of innovation and entrepreneurship by locating the park near universities, actively recruiting organizations (like the American Academy of Arts and Sciences), and used his vision to raise funding for the park. Davis strongly believed that profits could not be the only driver for creating the park - the betterment of the community should be the key goal. "The love of this state … was the motivation for the Research Triangle idea," he said. "Research Triangle is a manifestation of what North Carolina is all about." Research Triangle Park remains a nonprofit. The park is an unincorporated area, and state law prohibits municipalities from annexing areas within the park. Some local government functions are served by the Durham-Wake Counties Research and Production Service District, a special tax district created in 1986 that is conterminous with the park, wherein the property tax rate is limited to 10 cents per $100 valuation. The park has special zoning as a Research Applications District in the Wake County portion, and a Scientific Research Park in the Durham County portion. As of October 2012, both zoning areas are in the process of being revised to allow higher density development. The zoning changes are coupled with legislative changes allowing for Urban Research Service Districts (URSD) within the Park, which can include a mix of retail and residential usages. These newly permitted URSDs could levy taxes at the same rate as a neighboring city. On October 1, 2015, former President and CEO of the Research Triangle Foundation, Bob Geolas, announced RTP's plans for a $50 million redevelopment involving the formation of "Park Center." $20 million will be allocated from Durham County, $10 million from the Durham-Wake Counties Research and Production Service District, and $20 million as a result of land purchases and site work provided by the Research Triangle Foundation of North Carolina. Park Center is to be over 300,000 square feet of public space at the heart of the Research Triangle Park. This public area will include retail outlets, food and beverage venues, and entertainment space. Geolas states that "We want to make all of this as local as possible. I would like to have as few chains, no chains if we could. I'd love for it all to be local. Local coffee, local food, local produce, local products." The redevelopment plans also include exploring partnerships with regional transit groups. The hope of the Research Triangle Foundation is to broaden public transportation to and from the area. According to Geolas, "We are currently having discussions about bringing the Regional Transit Center over to Park Center so that we can connect with all of our transit links." A public commuter rail is also in talks. The Research Triangle Park Foundation operates three buildings within RTP. These three buildings are The Frontier, The Lab, and The Archie K. Davis Conference Center. The Frontier is a collaboration space that was first opened in January 2015. Since its inception, over 20,000 visitors have come through The Frontier's doors. The Lab is a full-service lab and office space that houses multiple Research and Development companies. The Archie K. Davis Conference Center is a 6,800-square-foot event space. 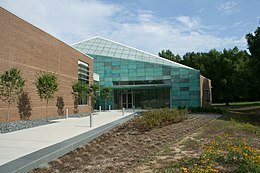 The AKD Conference Center is also home to the Research Triangle Park Foundation main offices. ^ Link, Albert N.; Scott, John T. (2003). "The Growth of Research Triangle Park". Small Business Economics. 20 (2): 167–175. doi:10.2307/40229257. JSTOR 40229257. This page was last edited on 11 January 2019, at 18:08 (UTC).